Recently General Electric (GE) announced that it will build a 400 MW solar panel manufacturing facility in the U.S. The plant will be the largest power plant of its kind. The $600 million plant is expected to employ 400-600 people and make enough solar panels each year to power 800,000 homes. The announcement follows suit with market-wide acceptance that use of sustainable energy forms will continue to grow rapidly in coming years. This power plant is just one of several renewable energy and energy efficiency projects GE has underway. GE's investment into sustainable energy has already had a sizable impact on Kentucky's green economy. 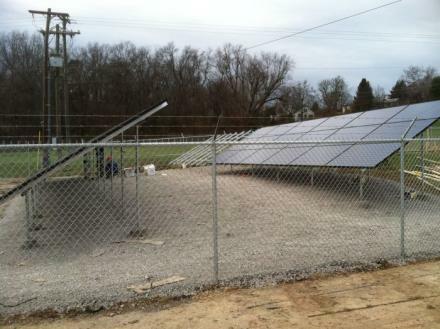 A recent report about the green economy in Kentucky by the Brookings Institution stated that while jobs are being lost in other sectors, between 2003-2010, nearly 5,000 clean energy jobs were created in Kentucky. The largest job growth came in appliance manufacturing - primarily from GE investments into its high-efficiency appliance manufacturing operations based in Louisville. When the decision to build the solar power plant was announced, GE indicated that the location would have been revealed by now - but they have made no such announcement as of today. What factors will impact their decision about the power plant's location? GE reported that the deciding factors, will include proximity to solar research facilities, labor availability, and state and local financial incentives. GE is likely going to choose a state that has passed a Renewable Portfolio Standard and/or other market-based incentives - similar to the policies that the Kentucky Sustainable Energy Alliance advocates to see passed in Kentucky.